What does a luthier do? Would you make a good luthier? Take our career test to find out how you match with this and over 800 other careers. What is the workplace of a Luthier like? A luthier is an artisan who makes or repairs stringed instruments such as cellos, violins, guitars, mandolins, dulcimers and banjos. The word luthier comes from the French word luth, which means lute, and the art of making and repairing instruments is a centuries-old tradition. There are two categories when it comes to making or repairing stringed instruments; instruments that are bowed, and instruments that are plucked. In most cases, a luthier will focus on making or repairing one specific instrument that they also know how to play. A musician will use the services of a luthier in order to keep his or her instrument in excellent playing condition. Factory luthiers use machinery more often than they use hand tools to create instruments. 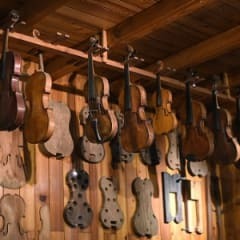 This means that they are able to make more instruments faster than if they created them by hand. This kind of luthier doesn’t make instruments, he repairs them. He or she deals solely with damaged or worn instruments and puts them back in working condition. This type of luthier is one who is very passionate about instruments and music, as it can be very difficult to make a lot of money as a self-employed luthier. Having their own business means that they can have the freedom make instruments, repair them, or both. Over time, an instrument changes and needs to be adjusted. Constant string tension, environmental factors, and general use all combine to push an instrument out of its ideal form. A luthier repairs stringed instruments that go through this kind of wear and tear. Luthiers also repair different kinds of physical damage, like dents or fractures, in an instrument’s body. A luthier cleans, seals, patches, and refinishes the damaged area so that it is barely noticeable. He or she then makes sure the wood is protected from further damage. If an instrument has been unused for a long period of time and can use a 'tune-up', a luthier is the person who will get it back into playing condition. Are you suited to be a luthier? Luthiers have distinct personalities. They tend to be artistic individuals, which means they’re creative, intuitive, sensitive, articulate, and expressive. They are unstructured, original, nonconforming, and innovative. Some of them are also investigative, meaning they’re intellectual, introspective, and inquisitive. Does this sound like you? 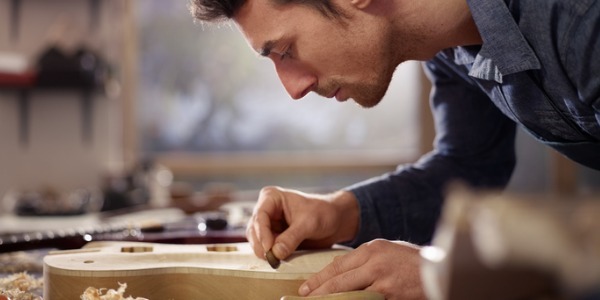 Take our free career test to find out if becoming a luthier is right for you. While some luthiers rent workshops or work within another business, most work in workshops on their own property, like a converted garage. It can be a dusty and a chemical-filled environment, so having proper ventilation is very important. It is imperative that the workplace can protect all the instruments from the elements, as a humid or damp atmosphere can damage the delicate wood. Depending on the client's needs and the amount of work a luthier wants to take on, the work hours can vary. Building an instrument from scratch can take months that involves working closely with the client.